Chelsea Green Publishing Company, 9781603588898, 288pp. The original Mid-Course Correction, published 20 years ago, became a classic in the sustainability field. It put forth a new vision for what its author, Ray C. Anderson, called the "prototypical company of the 21st century"--a restorative company that does no harm to society or the environment. In it Anderson recounts his eureka moment as founder and leader of Interface, Inc., one of the world's largest carpet and flooring companies, and one that was doing business in all the usual ways. Bit by bit, he began learning how much environmental destruction companies like his had caused, prompting him to make a radical change. Mid-Course Correction not only outlined what eco-centered leadership looks like, it also mapped out a specific set of goals for Anderson's company to eliminate its environmental footprint. A wide range of business readers--from sustainability professionals to green entrepreneurs to CEOs--will find both wise advice and concrete examples in this new look at a master in corporate and environmental leadership, and the legacy he left. Ray C. Anderson was founder and chairman of Interface, Inc., one of the world's leading carpet and flooring producers. His story is now legend: Ray had a "spear in the chest" epiphany when he first read Paul Hawken's The Ecology of Commerce, inspiring him to revolutionize his business in pursuit of environmental sustainability. In doing so Ray proved that business can indeed "do well by doing good." His Georgia-based company has been ranked number one in a GlobeScan survey of sustainability experts, and it has continued to be an environmental leader even after Ray's death in 2011. 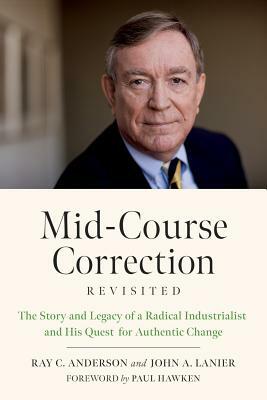 Ray authored the 1998 classic Mid-Course Correction, which chronicled his epiphany, as well as a later book, Confessions of a Radical Industrialist. He became an unlikely screen hero in the 2003 Canadian documentary The Corporation, and was named one of Time magazine's Heroes of the Environment in 2007. He served as cochairman of the President's Council on Sustainable Development and as an architect of the Presidential Climate Action Plan, a 100-day action plan on climate that was presented to the Obama Administration. John A. Lanier joined the Ray C. Anderson Foundation as executive director in May 2013 to advance the legacy of Ray, his grandfather. He is chair of the board of directors for Southface Energy Institute, the southeast's nonprofit leader in the promotion of sustainable homes, workplaces, and communities through education, research, advocacy and technical assistance. He also serves on the board of directors for Project Drawdown. Previously, Lanier was an associate attorney with Sutherland, Asbill and Brennan, LLP (now Eversheds Sutherland), specializing in US federal taxation. Lanier earned his juris doctorate from the University of Virginia School of Law, and he holds bachelor of arts degrees in history and economics from the University of Virginia. He blogs regularly and his TEDx can be viewed on YouTube.